There are a lot of different health hazards associated with solvent exposure including but not limited to toxicity to the nervous system, organ damage, respiratory issues, cancer and skin impairment. In addition to the health challenges that employees face, solvents are generally composed of hazardous materials and as such it is important that companies employ proper solvent storage and handling protocols. Millions of workers are exposed to solvents on a daily basis. Solvents are a commonly used item in most manufacturing and industrial operations. They have a variety of uses such as cleaning, degreasing, dissolving materials and removing paint. Commonly used chemicals include alcohol, mineral spirits, petroleum distillates, turpentine, benzene, toluene, xylene, perchloroethylene, trichloroethylene, methyl ethyl ketone (MEK), gasoline, and kerosene. Here are a few training tips that can keep your workplace safe and limit employee accidents. 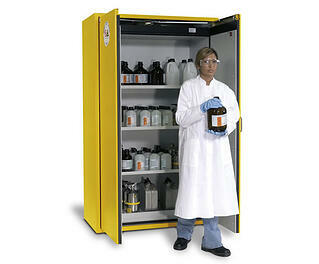 Keep solvents to be used during the workday in fire-resistant safety containers that have self-closing lids. Make sure that containers are properly labeled. Take only the amount of solvent you need for the job. Dispose of solvent-soaked wipes according to EPA guidelines. Keep your storage areas clean and clear of combustible items. Avoid stacking containers on top of one another. OSHA standards allow two containers stacked upon one another with a pallet in between. Don’t store solvents with incompatible materials such as oxidizers. Incompatible chemicals can create an explosive situation. Store drums in areas that are cool and out of direct sunlight to prevent high temperatures from increasing the amount of vapor in the air. Don’t store or dispense solvents near ignition sources. Avoid eating, drinking, or keeping food and beverages in solvent areas. This increases the chances of accidentally ingesting solvents. Avoid washing hands with solvents. Exposing skin to solvents could result in a rash, dryness, or other skin problems. Always wear required personal protective equipment to prevent hazardous exposures to solvents. Remove personal protective equipment carefully when finished working to avoid getting solvents on the skin. Wash thoroughly after working with solvents—and before eating, drinking, or using the rest room. Also wash before leaving the work area for other parts of the facility. Failing to do so could spread chemical contamination to other parts of the facility and put other employees at risk. It is also crucial for all employees to understand the emergency contingency plan in the event of an unforeseen accident or emergency. Every hazardous waste generator is required to have an emergency contingency plan which is a program designed to minimize hazards to human health and the environment from fires, explosions or an unplanned sudden release of a hazardous waste. Keep your workers safe by following these common sense tips.